We started a new unit this week on geometry, but aren’t all quite solid with adding and subtracting within 1000 yet, so we came back to that as well. This one was another attempt at a vocabulary question, and was based on responses to the pretest from our geometry unit. We had a great conversation about the difference between these two things, and how one is for 2D shapes and the other is for 3D. We got out the rectangular prism and a Power Polygon that was a square and looked at the differences. Oh, and notice how they connected the word “difference” with comparison, and so many of them drew a Venn Diagram. Nice work, Rm. 202 kiddos! Want to explain a couple of things on the chart, based on our conversation. The 900 at the top is because we talked about how estimating the answer before we solve the problem is a way of helping us know if we’re right. We knew that the 300 and 500 would be at least 800, but then since both of the numbers were so big, it would be closer to 900 than 800. We decided that the 69 in 369 was screaming at us (do you hear it??) that we should compensate and make the problem easier so we moved 1 from the 532 and made 370+531. Then we moved 30 over to the 370 to make 400 and added together the resulting numbers. Once we got to 901 – 18, we remembered what we had learned about constant difference and knew that if we added the same thing to both numbers we could get the same answer with an easier problem–thus we did 903-20, which is super easier than subtracting 18. I was impressed with their hard work and glad to see that so many of them could apply the strategies we’ve been practicing. 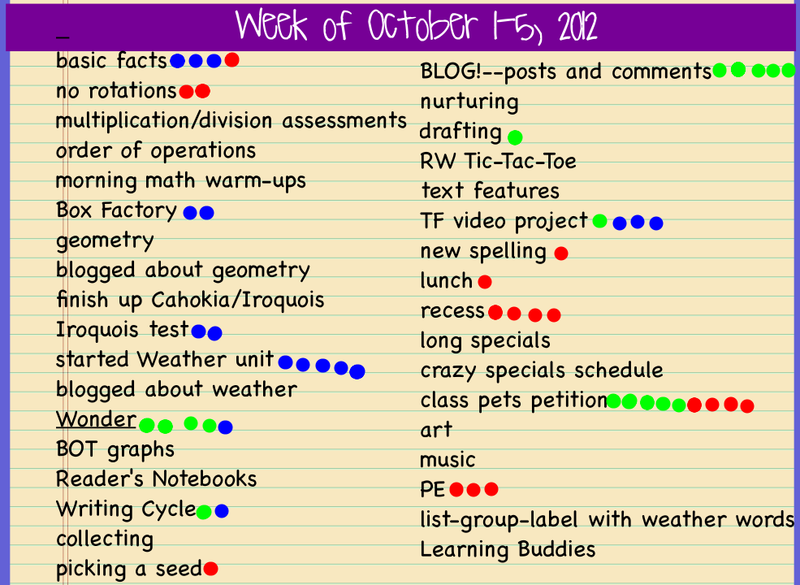 Today is a busy morning usually, because we do a Week-in-Review sheet that takes the place of the math warm-up. Often we don’t even get to it, but I decided to try it as our right-back-from-recess activity and it worked pretty well. We tried another one like yesterday’s but I changed the numbers a bit. We had to have a quick explanation of the directions, as many of them thought I meant that they should use their calculator. I just meant I wanted them to figure it out. 🙂 The 800 is our estimate, which we figured out by thinking about 500 + 400, but then realizing that 73 is about 100 so we subtracted that next. The red words were a request for a reminder of the strategies we have learned (as well as a reminder that I still owe them an anchor chart! ): Circle, Split, Add; Circle, Split, Add with a number line; splitting; a chart that we’d used during our investigation into the T-Shirt Factory (that is really a visual form of regrouping 10s/1s); and compensation (making an easier problem). As we were deciding upon a strategy to try together, I reminded them that good mathematicians choose one based on what the numbers tell them, not based on their favorite or the one they know the best. Kiddos decided that the numbers were telling them to subtract first, because they noticed that the 75 in 475 could help us subtract the 73. Once we rearranged the numbers, we realized our problem was a SUPER easy addition problem. On a side note, at our class meeting today, the topic of math came up and many kiddos marked it as their “trouble spot” with a red dot. I’m not sure how this is possible, but it seems that my class just had our first class meeting on Friday. I know that’s really not the case, but I guess all the meetings we have had have been either impromptu or have followed a different protocol than is typical to Rm. 202 because when I opened up our class meeting flipchart the other day the last one was from May 2015! WHAT? Well, regardless, we sat down to have a meaningful class meeting, following a protocol that everyone new because even if we didn’t do it this year “officially,” everyone had followed the same procedure in 1st grade. 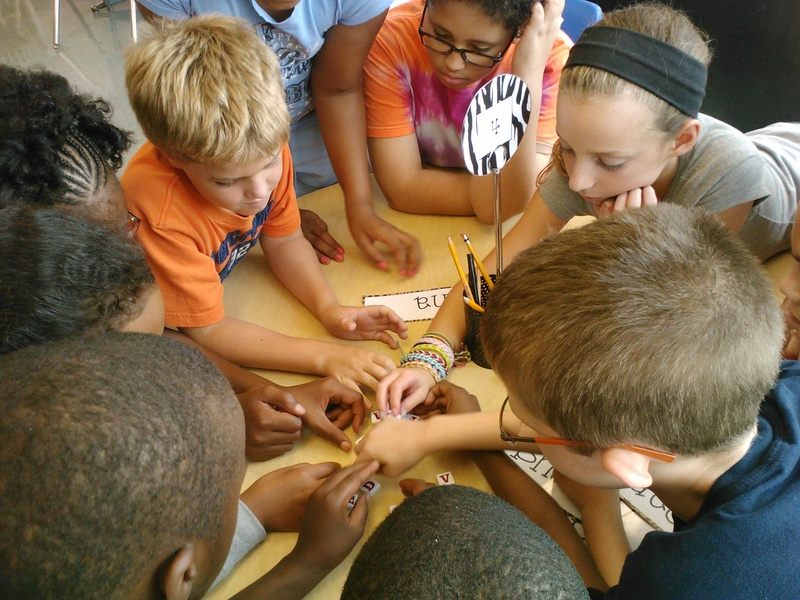 (In case you don’t remember how we do class meetings in our school and district, check out this post, as well as this one where I wrote about it previously, then keep reading. 🙂 ). A comment for the sake of transparency: our original chart got lost so I recreated the dots as I remember then. There may be a few in the wrong place, but this is generally the result after our choices. Sorry, friends! While often the red dots indicate times where our class was having trouble behaviorally, as we talked through the dots for this class meeting, we figured out that the red dots next to “subtraction in math” were related to the fact that the math we were doing was tricky (more on that later!). 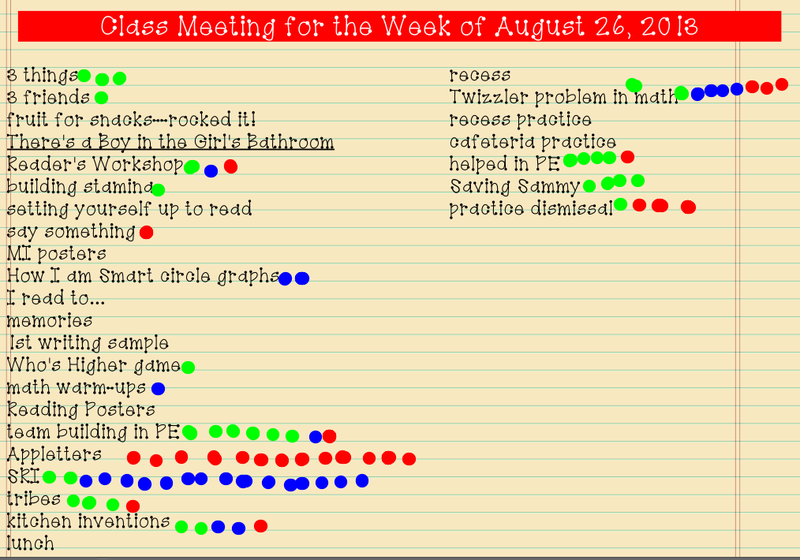 The red dots next to the others were things we had already worked through earlier in the week. All-in-all, this chart shows a pretty great week for Rm. 202! As is part of the typical class meeting protocol, the last part of the meeting is having kiddos write me a “Friday note” where they share whatever is on their mind: something from the meeting that they didn’t get to say, something from the week that they think when well (or was hard for them personally), an idea they have for something in our classroom, a question, what they’re doing over the weekend, etc. As with any class, the Friday note is perhaps one of my favorite pieces of communication with my students. I learn something every week, and I find that kiddos share things in this venue that they may not feel safe to say to me or have time to talk to me about during the course of a regular, busy day. These notes are so personal and give EVERY kid a chance to have a voice in our community. Friday notes #FTW! We had our first real class meeting this past Friday and it went really well! I say “real” because the week before (our first Friday) I walked them through the process of 5th grade class meetings, to either remind or inform them of how we’d be doing them this year. We had a busy week, huh? 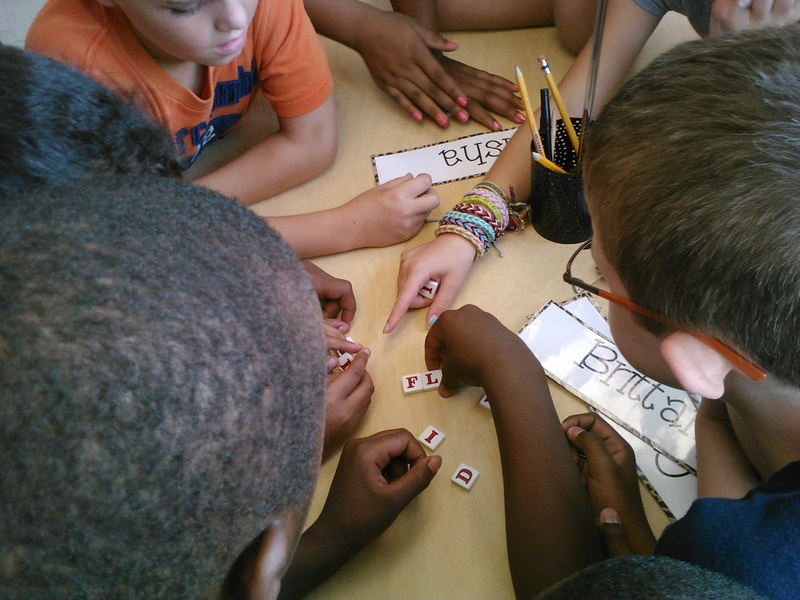 The lists at the beginning of the year always seem to be a lot longer because we do many more short activities as we’re getting to know the classroom and each other, as opposed to longer projects as we move further into the year. And for some reference, SRI is the Scholastic Reading Inventory and helps assess readers. Students get their Lexile level from this assessment, which helps them as they choose books (which I guess is why so many kiddos gave this a blue dot–signifying that they learned alot from that activity). I found it really interesting (and surprising, honestly) that so many kiddos chose Appletters as the topic to discuss and problem solve around. And with that many red dots I was dying to find out their thinking about how we could fix it for next time. have a place for “odd” letters (like Z, X, Q, etc.) to go if you can’t build a word, then those letters try to build something. 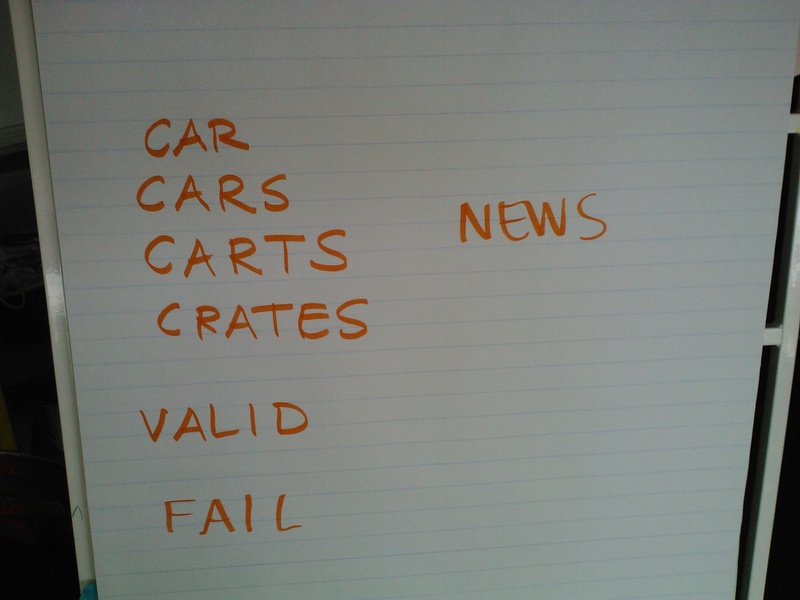 I also suggested that I would add some other guidelines for what kinds of words they could build. These were pretty good, and we were excited for the next time we played! Little did they know that their next opportunity would come that afternoon! The “rules” this time was that their words had to be at least 4 letters long, and could not be names (remember GIBY from last time?). We all agreed that the next time we were much improved. Check out our words the second time around! 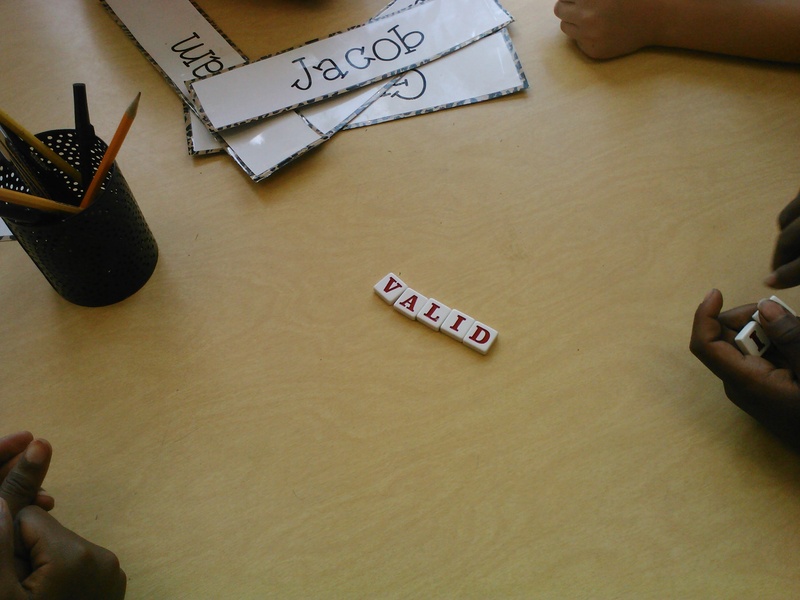 Someone said this word was inspired by a book cover they were looking at just before we played our game–funny that they were actually able to find the letters to build it! 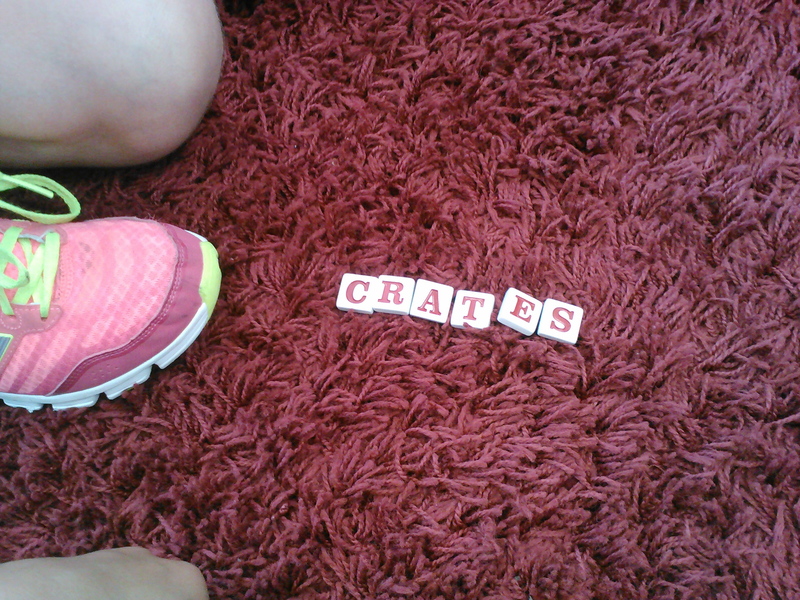 Check out the way CAR turned into CRATES–a longer word with more friends involved! Success! …and many hands made for light work. Definitely not an Appletters “fail” here–that’s a good word! Check this one out! Another one where someone (Owen!) was just looking at the letters and this came to him! Genius! What a FABULOUS example about how a group of people with great ideas can change things for the better! What a great start to the year, and an exciting precedent for class meetings to come. WAY TO GO, RM. 202!! YOU ROCK! So we did it. Remember last week when I explained our most recent class meeting? Well, the class meeting that we wanted to have with the rest of our grade happened this afternoon. I loved how all those dots around “Weather Unit” ended up looking a little bit like a cloud. Most of us started a big storm project in science this week (which I’ll write about soon! ), and our kids are really jazzed about it. As they shared their concerns about what was going wrong, we made a list of what was mentioned. After our 5 minutes was up, our list had some pretty yucky stuff on it like people being left out, some kids being rejected when they ask to play, arguing, poor sportsmanship, pushing and shoving, interrupting games just to be funny, and worrying about who’s popular and who’s not. We spent some time trying to problem solve around this topic, which proved to be pretty difficult with such a large group. Kiddos explained what they meant about how some thought they were more popular than others and wouldn’t let them play or tried to show off and always be the best at every game they played. We all agreed that our behavior did not match up with what we know to be true about Robinson’s 5th grade–that we are leaders, and that we support each other and rally around causes to help make everyone better. We agreed that this was not ok. The teachers did a little more in this meeting that we normally would–again because of logistics–but also because we wanted to make it very clear to our friends that this would not be tolerated. At Robinson, you are expected to be respectful to others no matter where you are–the playground in addition to your classroom or anywhere else you are at school. We left the meeting with a call to have each kiddo think about how they fit into this yucky puzzle of disrespect that has been happening outside. Everyone has something they can do differently on Monday. 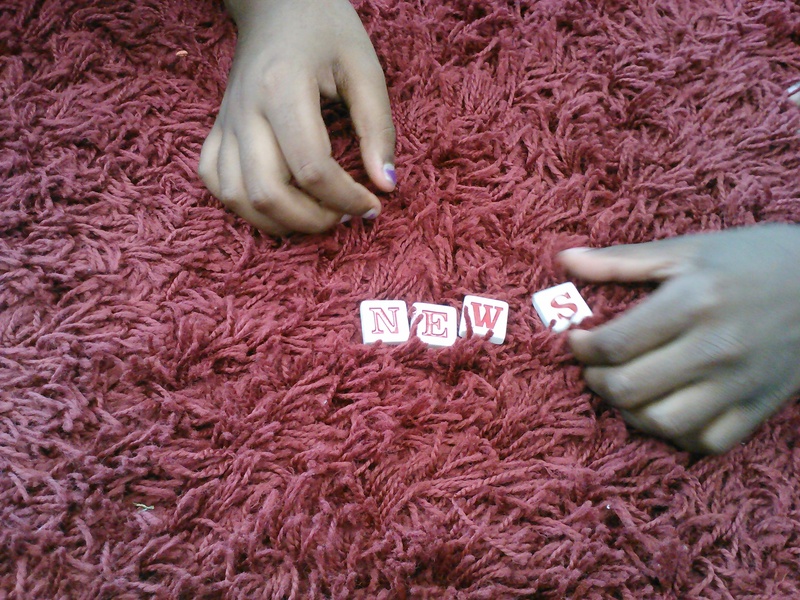 After we got back to our classroom, I had my kids do their regular Friday Note that always follows class meetings. As always, they could tell me whatever they wanted to, but I also had them add their goal for what they would do to make recess better on Monday afternoon. They understood that they each play at part in making our grade the best it can be, and I know that they will take the charge to change something tomorrow. Can’t wait to see what it is! I don’t know how long you’ve been reading, or how far back you’ve gone through the post archives, so I’m wondering if I’ve told you about class meetings yet? I wrote about the big idea behind them here, and the story was pretty great. This class is doing an amazing job with class meetings, too. Each week, though, when we sit down together to reflect upon the week and talk over things we want to improve upon, there aren’t really any problems to solve. Oh, come on. No way, right? 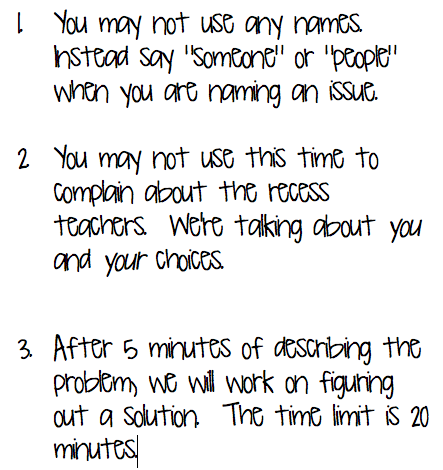 No really–we had to change the last question on our meeting protocol to “What do you want to talk about?” rather than “What do we need to improve upon?” because of how well these kids work together, learn together and just generally follow the rules and procedures of our school. Don’t get me wrong, they’re not perfect. We do work things out together. This week was an example of two kinds of issues to discuss. So, see all those dots after “class pets petition?” It meant that several people wanted to talk about that topic. But again, it wasn’t because it was a problem. They just wanted to talk about it. They needed to decide whether or not it was a good idea for Ames to make us an origami class pet, and if so, what type of animal we’d want to have. We decided that Ames (as the origami master of our class) would narrow the list down to four of his best creatures, and we’d vote on the one we liked best out of those four. Then we’ll chat about it again next week. Ok, so there did end up being a concern they did want to try to work out, and it was related to recess. A question was posed about what to do when you try to play with people and they tell you you can’t. We had a great conversation about strategies to try, words we could use and how it felt when someone told you you couldn’t be a part of the group. The idea of “popular” kids was brought up, and the concern was raised that there are some people in our grade who won’t play with certain kids because they’re friends with certain other people who are considered weird or different. It hurt my heart as I heard them talk about what was going on outside on the playground, and we decided that it might mean we needed a grander conversation. 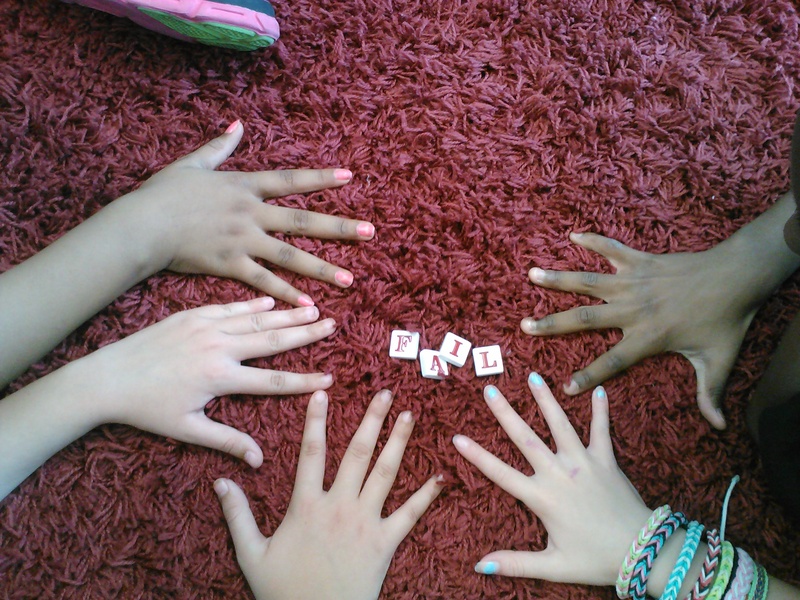 We agreed that we would do what we could to support each other outside–like paying attention to when people are alone and inviting them to play, or standing up for our classmates if we see or hear something mean being done to them–but we agreed that this might be a topic that would be better discussed with our whole grade level. So I have “homework” to coordinate a 5th grade recess conversation in the next few days. This was definitely a problem worth tackling, and one that we want to see solved. So today is the day! Thanks for joining the bloghop as we speak out against bullying! I called the last post Perfect Timing, meaning that it was great that I had found the link for this idea at the same time our school was celebrating No-Name Calling Week. But maybe I should have used that same name again today, as we had another great conversation about what’s been going on with bullies in our classroom. First, though, a reminder of what happened a few weeks ago. Dominic tells about a time when he was picked on for his size. Doniya says she’s sorry for what she’s done. Kelsey comes clean and apologizes. Taylor speaks her mind about bullying. Lauren and Molli talk about the changes that can happen when friends talk and problem solve together. So, today, as we have for the last few weeks during our class meetings, we came back to the topic of respect and bullying and how we’ve been doing with this. It seems that all is not perfect in our 5th grade world. While many in our class wanted to believe that one meeting could change things forever, today we had more concerns bubble up related to how some of us have been speaking to each other in a less than respectful way. I kind of have a love-hate relationship with this topic lately–I love that they are willing to continue to come back to the table (er, carpet) to talk about it, but I hate that they have to. I, like many friends in my room, wish it was as easy as saying once that we’ll all change our ways and be friends forever. Obviously, though, it’s not that simple, and it’s something we’ll continue to work on all year together. Our meeting was pretty intense at times today, with questions and concerns coming up about some of the same things we dealt with at our first big meeting. In the end, there were several one-on-one conversations that sparked from it, and we had to just agree to change some pretty big things in the way we deal with our classmates. I can’t decide if I like that class meetings are on Fridays or not. Sometimes I wish that they could come back the very next day and start working again on getting along and fixing the problems we discussed at our meeting. But at the same time, I appreciate the space that is afforded us by the weekend. Being allowed to talk about issues and work through them together, and then have some time (and space away from each other) to continue to think about it on our own before we come back together helps us to be ready to act differently once we see each other again. Kind of like the “time heals all wounds” idea, a topic that was really hot on Friday can simmer down a little by Monday so we can better respond–rather than react–the very next day. I love this group of kids I work with this year. They have their struggles (but what group of people who spends 8 hours everyday closely together doesn’t? ), but they are still so willing to work through them. Deep down they really just want to get along, and they try so hard to figure out how to make that happen. Even though it’s hard and messy, and sometimes it seems like we’ll never get there, so far we’ve come to some better understandings of each other. I hope that the lessons we’re learning about relationships this year are ones that will stick with them long after they leave the safety of our Rm. 201 community. So now it’s your turn: tell us what you think about our life lessons. Or tell us about a life lesson you’ve learned lately. Do you have any advice for us about how to work together or how to work through a conflict? What advice do you have for us as we tackle bullying head-on? We’ve love to hear from you! There is a big long back story I could tell you about life in our room lately–the not-so-pretty part that I don’t usually post about–but I’ll just state it simply: we have a problem with bullies in Rm. 201. So today at lunch I made the decision, with the help of my good friend and teammate Melissa, to have a meeting about it. We decided it was time to lay it all out. To sit down and hash out our problems together. I have to admit I was a little nervous about it. I wasn’t sure we’d come to a solution today. I wasn’t sure how long it would take. I wasn’t sure if I’d have all the answers I needed, if kids would be willing to share, and I really wasn’t sure how the bullies would react to the conversation. I think this resent class meeting was amazing never been better. I’ve never seen my class mates be so cooperative and helpful. Every one was amazing. I hope that the next class meeting is no different than the one today. I think many shout out’s have been given and I hope that everybody knows how absolutely outstanding it was. Today after lunch Mrs. Bearden pulled the entire class to the carpet in a circle to talk about bullies. The tension in the room was so bad, it was like I was a string being pulled really hard. We handeled it soooooooo well it was amazing! Mrs. Bearden said to tell names which no teacher has ever asked me before. It was scary I was afraid that if I said anything to someone, that they would get mad. But when the brave people in our room stepped up, It was amazing everyone was great. And it got even better when a friend of mine stepped up and said that she would like to say sorry to every one she had hurt. After that we talked about apoligies and eventually came to saying that we will start fresh. Right now as I am blogging well you probably not reading this as I am typing it, but as I am I hear people who would not usually laugh together, are. Every thing feels great in here. Especialy after we all had 2 billion pounds on our shoulders when we were talking about bullies. Today, are schedule changed after lunch/recess–a lot. Wait! Let me say that again–a lot.Here is how it went…We stopped in the familiar 3rd grade hallway on our way to room 201. Mrs. Bearden announced that when we walked into the classroom, we would not be sitting on the carpet facing her rocking chair, but in a circle. We were all very confused, but did it anyway. We all sat on the carpet in a circle. Mrs. Bearden sat with us and said “We have some bullies in our class” Everyone’s eyes paced around the room, searching for the bullies. Then, Mrs. Bearden said that this was just like a class-meeting, except we would be mentioning names. Silence. That was when the action happened.Everyone said something about how they have been bullied and who bullied them. When I was done with mine, I cried. I was so scared because I didn’t know what the bully would say to me about me sharing the scene when I was bullied. But everything was fine. The bullies said sorry in a serious, emotional way–they even got an applause. The one who bullied me came to me privately and said sorry. Everyone was so happy after the hour-and-twenty-five minute meeting. People in my class are so nice. They tought me not to take that anger out on them just because my brother did that to me. And they didn’t do that to me. They are just trying to help me and be kind and try to be my friend. I really thank Evan for been a really good or really really great host. I am so sorry. Tomorrow a new girl is going to be walking in this class and is going to hang out with people a lot. I said that stuff from my heart. I had almost cried when I heard all the people say my name. It was like a radio going. I was like “I really did this stuff to these people.” I was so so so so so so so so so so so so so so so so so so so so so so so so so so so so so so so sorry. I really think Evan can be a great host. The show can be called “The Evan C. Football Player Show”. So thank you everybody and I am sorry for what I did. I am so sorry for calling you a big elephant head and sorry for being mean all the time. And I mean all the time. Sorry. Bye! This meeting, which was not structured like our usual class meetings, was a truly amazing scene. I wished that I had taped it, so you could really see and hear what happened. I was beyond impressed and proud with how bold and brave and honest everyone was. They were so respectful and real while they calmly aired their grievances and talked about how they felt. There was a natural leader that arose, and he did such a super job of synthesizing, restating and clarifying what the group was saying. After about an hour-and-a-half, we got to a place where we clearly understood 1) what the problem was, 2) why some of it was happening, and 3) what we were going to do about it. The feeling in the room was calm and relaxed and we knew that everything was (and is) going to be all right. Obviously we didn’t solve all the world’s problems during that session, and we know it’s not going to be easy, but we have hope. We know what we’re capable of, and trust that we will do what say we will do. Time will tell, but I believe we’re on the right track. I think we’re at a fork in the road, a turning point. We grew together today, had a shared experience that we can use as a benchmark for the future. We’re closer, and we care more for each other. So many people left with such great energy that I know it will affect us in a really meaningful way. Remember all the times I’ve said my kids were amazing? More proof today of how that statement is true. What stories do you have about bullies in the classroom? What advice do you have for my students about how to deal with bullies? When have you had a scary conversation that ended up better than you’d expected? We’d love to hear from you!